Flowing meltwater from Ice Mountain, coupled with some rather over-enthusiastic dwarven mining, has opened up an entrance to what the dwarves have named the Living Rock Cavern. The Living Rock Cavern is a members' only area, hidden away in the depths of the Dwarven Mines. In this dungeon, there are many opportunities for high leveled players to train their combat skills or their Fishing and Mining levels. 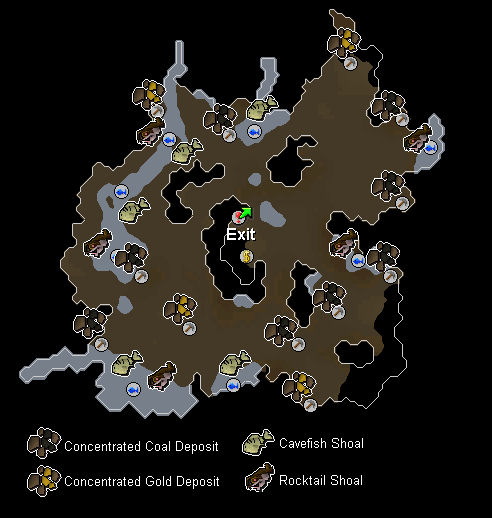 The Cavern offers a rich abundance of Coal and Gold Ore, while also giving players the opportunity to fish Rocktail and Cavefish. 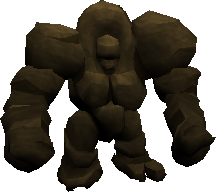 Beware, though, because within the cavern lurk its guardians, the infamous Living Rock Protector (level 120), Living Rock Striker (level 140) and Living Rock Patriarch (level 200). If you manage to survive all that, you will be able to mine from concentrated deposits of coal and gold, which can give up to full inventories of ore. There are also pools within the Cavern from which you can fish Cavefish and Rocktail. 77 Mining - Concentrated coal deposits. 80 Mining - Concentrated gold deposits. 85 Fishing - Catch Cavefish. 90 Fishing - Catch Rocktail. 88 Cooking - Cook Cavefish. 93 Cooking - Cook Rocktail. Ability to defeat or survive a level 120, level 140 or level 200 monster. In addition to all of the above, you will need some armour. 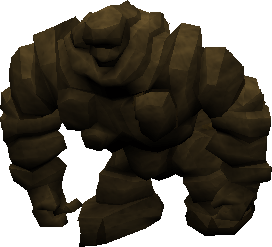 The Living Rock creatures have low attack and strength. If you are just running around to go mining or fishing, then full Rune armour is highly recommended. Wearing weight reducing items such as Boots of Lightness, Agility Clothing, Penance Gloves and Spotty/Spottier cape will be a great deal of help. If you intend on training combat skills here, you will need better armour. 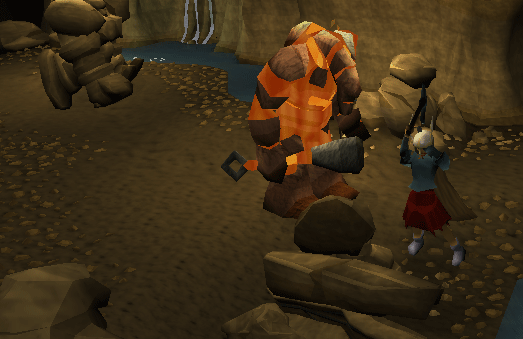 Barrows melee armors are most effective against the Living Rock monsters. Full Guthan's armour with the Warspear, with its healing powers, is most effective. A Saradomin Godsword, or an imbued Excalibur, or a summoned familiar with healing powers such as a Void Spinner, Bunyip or Unicorn is also useful. Otherwise, without some other source of healing - food is a must. 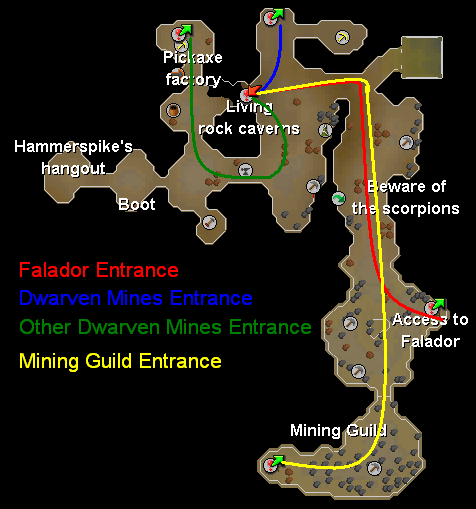 Method 1 - This is the quickest way to get to the Living Rock Cavern, just simply teleport to Falador and walk east towards the statue of Saradomin. Then head north-east into the Dwarven Mines. Method 2 - Teleport to the Burthorpe Games Room using a Games Necklace, and walk south into Taverley. You can also teleport to Taverley if you have a house there by using the Teleport to House spell. Then go east to Doric's anvil, and follow the map to reach the Dwarven Mine. 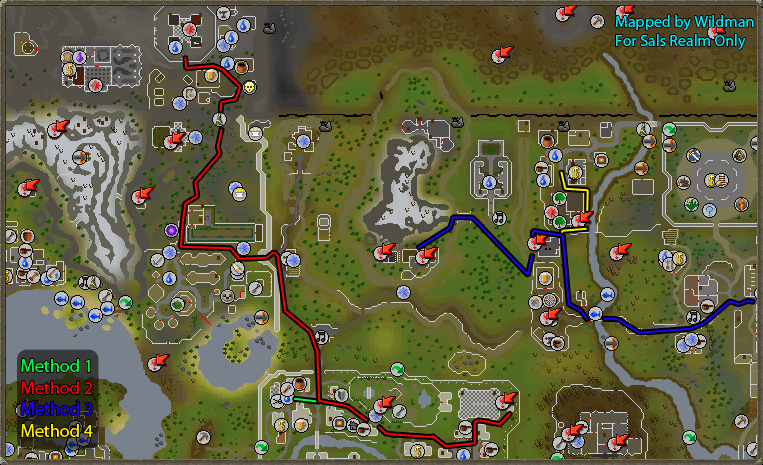 Method 3 - Teleport to Varrock, and head west. Go towards Edgeville, but stop and head west when you reach the area with the Yew Trees. Head up the slope, and go down the ladder. Method 4 - Teleport to Edgeville by using either Paddewa Teleport, Home Teleport (Ancient Magicks), or a Glory Amulet. The follow the map to the Dwarven Mine. Once arriving in the Dwarven Mines, you need to find the entrance to the Cavern. Once you climb down the rope, you'll see a vast cavern. Nearby is a dwarf, named Farli. Farli will give a rundown on what to do if you ever need it. Next to Farli is a Pulley Lift. By using this Pulley Lift, you can deposit items into you bank. 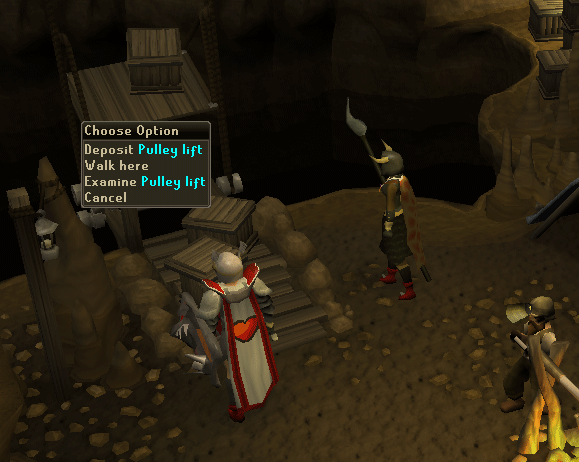 This makes quick and easy banking while taking advantage of the cavern's resources. However, you cannot withdraw any items in your bank using the Pulley Lift. Within the cavern, there are several sites for mining and fishing. The map above is helpful to finding these the concentrated ore deposits and fishing spots. There are 12 Mining areas in total, and they are scattered throughout the Cavern. There are a total of 8 concentrated Coal deposits, requiring Level 77 Mining to mine, and 4 concentrated Gold deposits, requiring Level 80 Mining to mine. These concentrated deposits give many more ores per rock, and it's possible to receive a whole inventory of ores by mining only one deposit. Also scattered throughout the Cavern, there are a total of 8 Fishing spots. These fishing spots are special however, as they are home to 2 new species of fish, the Cavefish and the Rocktail. The Cavefish require a Fishing Rod, Bait and Level 85 Fishing to catch, and give 300 Fishing xp each. 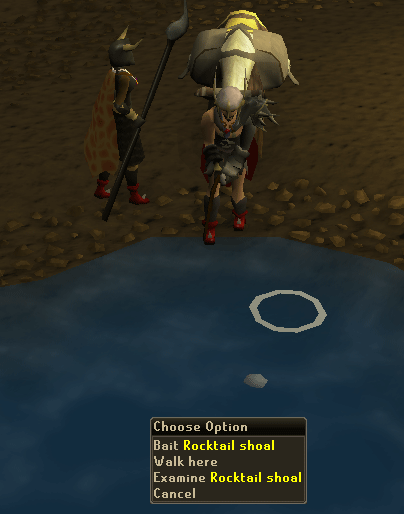 Rocktails require a Fishing Rod, Living Minerals, and Level 90 Fishing to catch, and give 380 Fishing xp each. The Rocktail fishing spots are easily noticeable, as they have larger bubbles than the Cavefish fishing spots. Farli can give you an introduction to the caverns, and what to do in them. These monsters are found scattered around the Cavern, and are very useful for high-level combat training. By mining the remains of their body after you defeat them, you may receive some Living Minerals, which are used as bait when fishing Rocktails (requires Level 73 Mining). When in the Living Rock Caverns, do not attempt to do anything without decent armour. These monsters are aggressive and can hit very high, so be prepared! 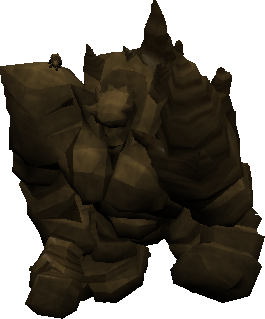 If you decide to train your combat skills on these monsters, it is recommended that you set your respawn point to Falador (Requires Recruitment Drive). These little creatures do nothing, except add more to the scenery. The Protector is a melee only based monster. The Striker will attack with both melee and range attacks. The Level 200 Living Rock Patriarch does not appear often, though he is extremely dangerous. Prayer against melee in close quarters should protect you from his most dangerous attacks. Although, if you try to escape, it will attack you with a ranged attack.